What if the captain told the owner of a Superyacht, “I’ve found a new way to dramatically reduce exterior maintenance cost, provide excellent protection from the elements, and keep your yacht looking beautiful all year round.”? Welcome to Wayne’s Wax. We will show you how! As owners and captains of Superyachts know, it is essential to routinely wax and maintain the exterior of these multimillion dollar investments. Why pay a detailer exorbitant rates to wax your Superyacht when you already have a crew on the payroll? Your crew will be eager to discover an easier and more efficient way to protect the boat’s finish and to keep it looking great at all times! Check out the great benefits Wayne’s Wax has to offer! Compare to what you’ve been paying for a detailer and see the savings add up. Of course we’ll be happy to provide full service for those who prefer that. Just contact your Wayne’s Wax representative to discuss the particulars and set a date for service. A Wayne’s Wax technician will inspect your Superyacht to determine how many workers will be needed, what systems will be provided and number of days for completion of work. A working technician/supervisor will be on the vessel during the entire process. Once the initial job is done, regular use of Wayne’s Wax Multi-Layer Marine Wash will enable you to easily clean and maintain your Superyacht exterior. Please note: Floating pontoons for hull waxing will be supplied by Wayne’s Wax. Any buffing/polishing service that may be needed before waxing will be subject to an additional charge. The cost of materials is only an additional 20%. After your initial meeting and inspection, our technician will give you a written agenda with guidance on how to proceed to the next step. That technician will work with you from start to finish. We’ll take care of system delivery before and pick up after completion. We will provide training for your crew on the proper method of Wayne’s Wax application. We’ll also train your crew on how to handle post-cleaning and routine maintenance. *With every new cycle, you will receive a gift of 5 gallons (1 pail) of Wayne’s Wax Multi-Layer Marine Wash.
From the moment we start until the end of the process, we promise our clients a superior product and service for their Superyachts. You’ll find everything you need to know below. Just click on the section that covers your interests. I would like to express my gratitude for what you have given me, my crew and the owner. Our boat was painted two years ago, and although looked after, it had slowly begun to decline as they do. There had been a notable difference in the amount of energy required to just do a simple wash down! After preparing for and applying your Wayne’s Wax system, I am very pleased with the results indeed. She has a beautiful shine, and I have already received comments on how good she looks. It even deters guests from placing glasses on the horizontal surfaces because they slide right off! I was also incredibly happy with the price of your product, with the use of your equipment and the impeccable service and supervision we received from you personally to make sure we got the most out of Wayne’s Wax. Keep up the good work and I look forward to doing business with you again. We heard of Wayne’s Wax through a mutual friend. Our paint is over eight years old and showing signs of moderate to severe oxidization. Unable to complete a new paint job at this time, we looked at exploring other options to bring the paint back to Superyacht standards. After preparing the oxidized surfaces, Wayne came in and applied a generous coating of Wayne’s Wax Roll-Tech Wax™. We now continue to maintain it using Wayne’s Wax Multi-Layer Marine Wash, and it has never looked better! We also had problems with generator exhaust eating into the paint and creating an unwashable layer of embedded soot. Wayne suggested we use his Wayne’s Wax Long-Haul Coating. We now apply this before trips and then simply remove it upon arrival. This protects the paint and wax whilst adding another layer of protection, and it minimizes our wash-down maintenance. What we like most about the Long-Haul Coating is that it builds up on the surface of the paint meaning there is no longer any need to buff. To add to that, it minimizes maintenance. It’s a win-win. The owner of Wayne’s Wax approached me and told me about a wax and a system that could save me time and money. While I was skeptical at first, it turned out to be everything he said and more. The results have been terrific! We have been using the product for a full year now on both our 112’ yacht and 32’ tender. I highly recommend this product for use on any vessel. After we had Wayne’s Wax applied for the first time, I was surprised at how much easier it is to keep the boat clean and maintain its exterior! I was so impressed with Wayne’s Wax that I told my captain, “If we do not continue to use Wayne’s Wax on the boat, I will resign.” The boat has never looked this good in years, and the Wayne’s Wax system is now part of our regular maintenance program. Great product! Part of the reason we sold our boat was because we could not match the service we received from Wayne and his product Wayne’s Wax once Wayne and his team left the area and moved to Florida. He was very professional and the final product was always beyond our expectations. We have a 2013 Beneteau Gran Turismo 38’ motor yacht that was delivered to us new last July 2013. In spite of the Florida sun, it still looks as shiny and new as the day it was delivered thanks to Wayne’s Wax and the meticulous application process that Wayne uses. We even get comments from our neighbors at our condominium about what a beautiful finish it has. I highly recommend Wayne and his Wayne’s Wax treatment. I am the captain of the 82′ Horizon Motor Yacht, Jeanine. We needed to have the gel-coat compounded and polished because it was badly oxidized. Wayne of Wayne’s Wax helped us to restore it and did a beautiful job! Wayne also introduced us to the Wayne’s Wax system of waxing the boat. It was incredible how much labor the system saved, and the final result left a beautiful high gloss finish! The boat looks amazing! I highly recommend this product to every boat owner! I have used Wayne’s Wax this past year on my Tiara Sovran yacht and found it to be an effective protective coating lasting longer than previous products I’ve tried. I was especially impressed with the new format for applying wax because it is rolled on rather than applied by machine or by hand, and it reaches more surface area. I have been very pleased with Wayne’s Wax as a protectant and would recommend it to others looking for more complete protective cover. For those who love the details, here’s everything you need to know about how Wayne’s Wax will provide state-of-the-art protection for your Superyacht. First, it is important to know that by following the recommended Wayne’s Wax maintenance schedule, you can extend the life of a painted or gel-coat surface by 2 or even 3 times, thus eliminating the expense of frequent respraying! After many years of research and development, Wayne’s Wax was born. It is a revolutionary system that allows the amino functioning polymer sealant to be rolled onto the surface of your Superyacht. The application process features Wayne’s Wax Nano-Flow Roller Head that allows a rapid application of wax sealant in a highly controlled process. The Nano-Flow Roller Head permits application at the precise level of viscosity required for the job. The wax sealant is compatible with all painted, gel-coat and aluminum finishes. It can even be applied to protect the stainless steel railings, Plexiglas ® and tempered glass. Wayne’s Wax is superior in application efficiency compared to other conventional waxing methods. The Wayne’s Wax Portable Power-Waxing Unit is designed to be used for rapid application of our unique wax sealant. The specially formulated wax sealant is applied in a rolling motion over the surface of the area to be protected. This system greatly reduces labor costs versus time-consuming traditional methods of wax application done by hand or with a buffing machine. During application, Wayne’s Wax fills microscopic pores and adheres to the surface of the paint or gel-coat. The wax will cure to a powder form, and the dried wax residue can then be removed using our proprietary vacuum removal brush heads. One of the unique things about Wayne’s Wax is that there is no panic to remove the dried wax sealant residue after it has been applied. A day or two later would be perfectly fine. Wax drying time is usually between four and six hours (depending on circumstances such as direct sunlight and humidity. Closer to the water line where the temperature drops, may have an effect on the drying time also) before the residue may be removed. However, as a rule of thumb, your Wayne’s Wax technician will generally leave the wax to dry overnight and remove the residue the following day or even a day or two later. The years of research and development that have been devoted to creating The Wayne’s Wax system is revolutionary and is cost effective and extremely beneficial for Superyacht owners, captains and crews. The major factors that affect the durability of gel-coat and painted surfaces are exposure to moisture, heat, and ultraviolet radiation from sunlight. Wayne’s Wax uses ultraviolet absorbers and stabilizers that increase resistance to exposure and help to avoid the breakdown of resin that leads to oxidation and fading. This, in turn, prevents the pigment from washing away. Following a routine exterior maintenance program can greatly reduce surface oxidation. At Wayne’s Wax, we have a system that not only works but is cost effective! How to clean your boat and enhance protection once Wayne’s Wax has been applied. Wayne’s Wax Biodegradable Multi-Layer Marine Wash has been developed exclusively for boat maintenance after Wayne’s Wax Sealant has been applied. “Multi-Layer” means just that. The wash creates a polymer UV protective barrier over the top of Wayne’s Wax and enhances protection while cleaning. The more you clean your Superyacht, the more protection it has! This innovative solution using polymer-layering technology yields amazing results! Not only does the Multi-Layer Marine Wash clean beautifully and provide great UV protection, this covalent bonding formula resists and repels minerals, salts, oil-based residues, pollution and bird droppings that may stain your boat. When used weekly, the wash makes cleaning much easier while extending the life of Wayne’s Wax Roll-Tech Wax Sealant. Resistance to irritants may vary depending on where the boat is located such as near an airport, freeway, etc. Over the years, I have seen many companies/people/crews use ordinary cleaners to maintain their boats’ exteriors. Many of these cleaners use a degreasing formula. While the degreasing formula may do a good job of cleaning, ironically, with repeated use, it may actually strip the protective wax coating you had applied. This will not happen with Wayne’s Wax Multi-Layer Marine Wash! As an added bonus, Wayne’s Wax Multi-Layer Marine Wash is very economical. Use just 4 ounces per gallon or 118.29 milliliters per 4 liters of water. Please note: Curing time after using the Multi-Layer Marine Wash on your boat is one to two hours depending on temperature and humidity. Due to the natural effects of evaporation, your Wayne’s Wax representative will recommend that you not wash your boat directly in the sun between 11 am and 4 pm. Boat owners are frequently surprised that after application of the Multi-Layer Marine Wash, the water will sheet off instead of beading off because of the nature of the polymer layering technology. This sheeting will reassure you that the marine wash is functioning correctly. How Does Wayne’s Wax™ Save You Time and Money? First, it is important to know that by following the recommended Wayne’s Wax maintenance schedule, you can extend the life of a painted or gel-coat surface by two or even three times, thus eliminating the expense of frequent respraying! Wayne’s Wax eliminates up to 80% of the labor required for traditional methods of wax application. Wax application labor costs will be greatly reduced by utilizing your crew or day workers. Use of the Wayne’s Wax system will increase the ultraviolet protection for your Superyacht’s exterior. Your Superyacht will be easier to clean and maintain after it has been waxed with Wayne’s Wax Roll-Tech Marine Wax and by using the Multi-Layer Marine Wash, to keep it clean and always looking beautiful and protected. Over time, Superyacht owners will see greatly reduced labor hours. As we all know, a beautiful boat that has been well maintained is easier to sell and will have a higher resale value. I have spent thousands of hours in the United States and around the world developing my craft in the Superyacht exterior maintenance industry. Wayne’s Wax has evolved directly from that experience and knowledge. 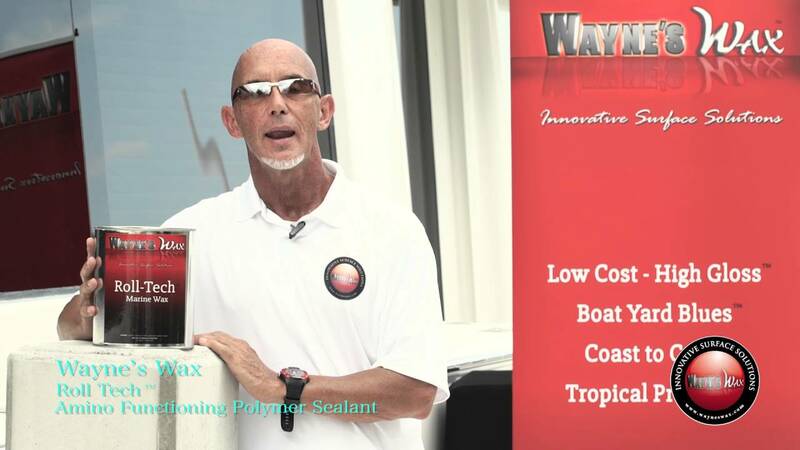 Wayne’s Wax revolutionary technology will change the way Superyacht owners protect and maintain their boat exteriors! I have not reinvented the wheel. However, I have developed a system that will change the way we do things! I am a great believer that things never remain the same and that change is good! Wayne’s Wax is a testimony to that. Wayne’s Wax will hang a banner 6 x 6 feet on the port and starboard sides of the boat. (For the waxing duration only); LIKE us on Wayne’s Wax Wax Facebook page and post a testimonial; Wayne’s Wax will make a short Smartphone video to post on the Wayne’s Wax website, Facebook, and LinkedIn pages (Name of boat will not be shown).